AWT Colors and models in Colors. A font is a text string that is visible to the end user. This text string can be displayed with the help of text field or can be drawn on the screen. Font object can be created using the above three parameters in the font constructor. If either of the above five are used in the object creation, then default Dialog, Plain and 12 size is executed. BOLD|ITALIC is a combination of bold and italic font. To underline the below fonts, use FontMetrics Class. Font size will be represented in the form of an integer. It can be increased or decreased as per the requirement. By default, the size of the font will be 12. Below are some of the examples of fonts with font names and style. FontMetrics abstract class of Java gives detailed information about a font and placement of strings i.e the height and width of the strings. getAscent, getLeading, getDescent getHeight, and getWidths are some of the methods of this class. Adding AWT Colors improves the readability. 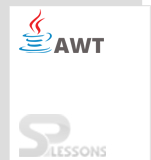 This can be done by adding the color class to the java.awt package. RGB Model: Red, Green and Blue are the primary colors in this model through which many other colors can be formed by their combination. The value ranges between 0 and 255.If the value is not between the range, IllegalArgumentException is thrown. HSB Model: Hue, Saturation and Brightness forms the HSB Model. Color Constructor will be passed with the values ranging between 0.0f and 1.0f. If the value is not between the range, IllegalArgumentException is thrown. Font has name, style & size and java.awt.font is the class. 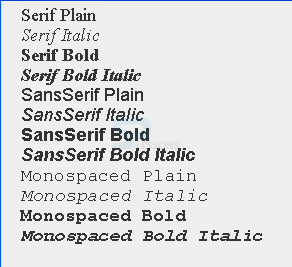 Monospaced, Serif, SansSerif, Dialog, and DialogInput are the Font names and Plain, Bold, and Italic are the Font Styles. RGB and HSB are the Color Formats.